The current situation of international commerce has created important interactions among people from all over the world. People also move easily around the world for many reasons. If you have traveled to foreign countries in the past, you must already know that one of the most important barriers found to do business or relocate in a different country is the language. Translation services have emerged as a vital solution and many people depend on them. Depending of the type of situation that you handle, you could be asked to provide certified translations for certain documents. A translation which is certified is a translated document or text which includes a declaration from the translator affirming that he or she is competent in both languages and the translation is completed to the best of his or her knowledge. Translators include their name, signature and contact information to support their certification. This certification allows people who check those documents to understand them in their language and trust their accuracy. Most of the time, government offices and educational institutes request them. In order to make those certifications more trust-able it is also advisable to get them from professional translators. Some institutions go even further and request notarized translations. 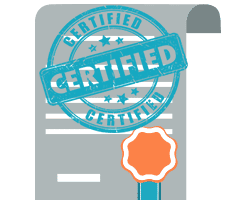 A notarized translation includes an additional step by completing the certification before a notary officer. There are some debates about the convenience of adding this additional step to a translation, but in the end organizations and agencies will decide which one they request. Sometimes they are requested for legal matters. For instance, US Citizenship and Immigration Services used to request notarized translations, but now they only request translations which are only certified. In any case, professional translators and translation service providers usually have both services available. If you need to use notarized services or certified translation services, it is important to clear it up in advance with the translator. Simply fill in the form and hit the download button, a new window will open containing our free ebook. What kind of official documents do we handle? UTS provides US certified translation services from over 80 languages into English. Our translators are specialized in translating official documents for immigration in the USA. We are fast, we work around the clock, we are affordable and our translations are guaranteed to be accepted at any USCIS office. Birth certificate translation is required if you want to immigrate to the United States. 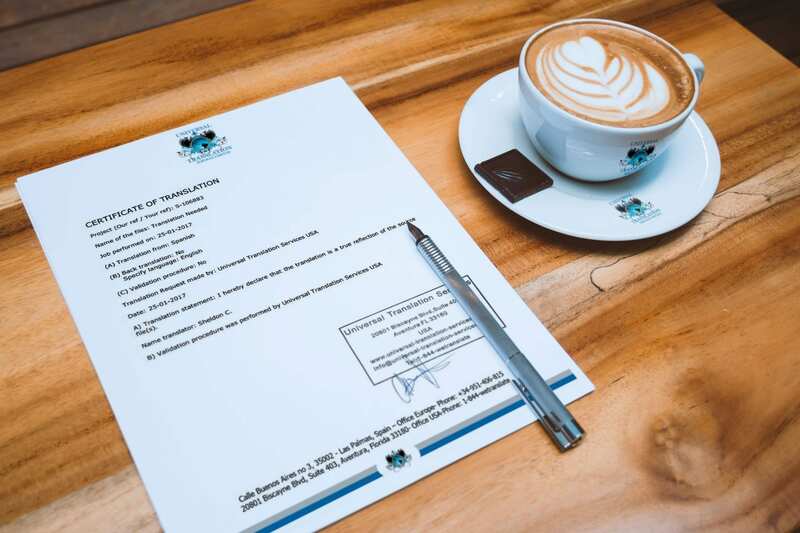 With us you can have your birth certificate translated and certified in under 24 hours, at a special price: only $20 per page. USCIS acceptance guaranteed, from any language into English. If you need your marriage certificate translation in a rush, you may have to pay extra fees when it comes to other companies. With us you can have your marriage certificate translated and certified in 24 hours, with no rush rates or any extra fees. Those needing divorce certificate translation for use in the US can count on us. We translate from any language, we’re affordable, we’re fast, and all our translations are accepted by any US state institution. If you want to study in the United States and you’re from another country, you will need to translate your diploma and any other degrees you may have. Our diploma translation service is fast and affordable. If you adopted a child and want to become a US citizen, you may need to have the adoption certificate translated into English as it will be required by USCIS. With us you can have it done in under a day. If you’re planning to immigrate to the United States and you come from a country where English is not the official language, you will need to have your personal documents translated and certified. We provide certified translation services for immigration for all your documents. If you’re dealing with USCIS as a foreigner, you already know you need to provide them copies of your personal documents along with a translation that is certified for each of them. You can always count on us for your USCIS translation needs. A fairly new service we provide for families wanting to establish in the United States. With us you can have your family documents translated all at once in record time. All our certified translations are accepted by any immigration office in the US. Although USCIS no longer requires notarized translation, there are cases when you need to have your personal documents translated and notarized. You can always count on us to provide you with notarized translation for US at a price you won’t find anywhere else. Having your police records translated and certified is yet another requirement from USCIS if you’re planning to immigrate to the US. Along with that we can also translate any other reports, like your medical records or even your FBI record. Get in touch for more information. Other companies are charging an arm and a leg for the certification of translation. We don’t! With us you can have your personal documents translated and certified at the lowest price you’ll find on the internet! There are cases when you need to have a death certificate translated for various reasons. Maybe in a court of law, or for legacy settlements and property issues. With us, you can have it translated and certified for use in the US. How does a translation certification look like? the end result is a document which looks like the original, only translated. The translation is then sent to the client in pdf format along with our certificate of accuracy. If you want to see how our certification looks like, click the image on the right. A professional translator is an individual who has the right means and expertise to render a text from one language to another with specialization in the legal field and using the right legal terminology. In order to become a translator capable of rendering translations you need to obtain a translation certificate that allows you to deliver translation services for example with the ATA. What does it mean for a translation to be certified? 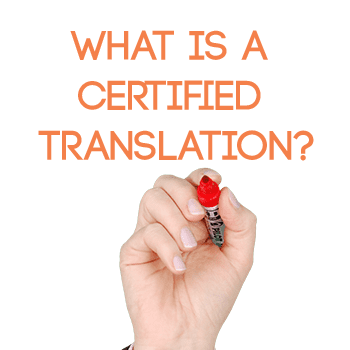 When a translation needs to be certified it means that the translation is done from one language into another by a professional translator or professional translation agency. With the translation you will receive a certificate which states that the translation is done by a translator knowledgeable in the source and the target language checked by a second translator and that the translation is complete and accurate. What is the ATA certification? The ATA certification – American Translators Association is a well-known certification in the field of translation. The purpose of this certification is to acknowledge certain high levels of professional standards. Individuals and companies holding the ATA Certification are trusted professionals expected to deliver highly accurate and qualitative translations. 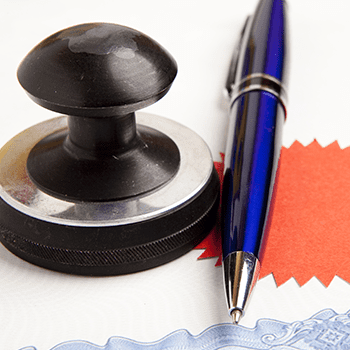 Can I translate my own birth certificate for immigration purposes? No, you are not allowed to translate your own birth certificate. USCIS accepts translations together with the certification of accuracy provided by a certified translator or a translation agency. It is best to use the services of a specialized translation company in order to make sure USCIS will accept the translation and there will be no delays in your immigration case. The price is different witch each translation company. The prices range is between, for example $65 and $75 including the certification. Universal Translation Services is the only agency offering $20 per page with a maximum of 200 words, with same day delivery at no extra or hidden cost. If the amount of words is more than 200 per page, we charge $0.12 per word for all languages. How long does it take to get my certified translation? When you have one, two or three pages depending on how many words there are on a page, it is possible for the translation agency to deliver the same day. If you have more than three pages, the translation will be delivered the next day. This is the normal procedure but always depends on the word count, language combination and the availability of the translators. How does a certification of a translation look like? 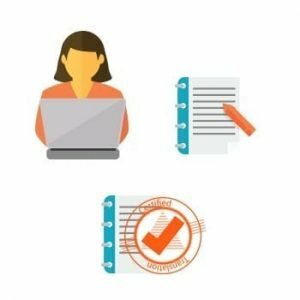 The certification is another piece of paper attached to the actual translation, which states that the validation procedure was performed and confirm that the provided translation is complete and accurate. The certification is signed by the general manager of the company and has the company stamp on it. See example here. Is a certificate of accuracy valid in the United States, but also in the United Kingdom? Yes, the certification procedure and regulations are the same in the United States and in the United Kingdom, which means that a certificate of accuracy issued by a US translation company will be valid in the United Kingdom as well. How do I get a translation that is certified? Contact a translation agency, send the document, receive the quote and the deadline, after payment the agency starts with your translation. 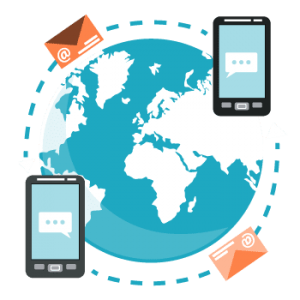 On the delivery date you get my email the translation for approval, after approval you receive back the source document (document that you send for translation), the translation and the certification. Copies by email are always accepted. In some cases, you need the original document, ask for sending to your address (note there will be an extra cost involved). Do you still have questions about certified translations online? The need for official translation services is something that you cannot take for granted any more. You need to make sure that you get your official document translation done by professionals. There are so many good reasons why you should seek official translation, especially when you have so much at stake. If you are ever in search of someone who can get you the necessary documents that you need translated, look no further than this. Official translation services come in handy for different types of tasks. It does not matter the document that you need, you will always benefit from official translation. Translation from one language to another can be a difficult process for you, especially if you are trying to get some documents prepared for official purposes. However, with official document translation, this will be the last thing that you ever have to worry about. Go ahead and get in touch with us and see how much we can help you. If you need official translation services for US then you’re in the right place. Contact us now for your free quote! 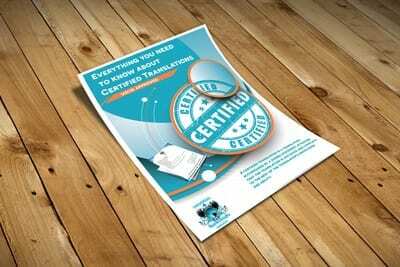 What is a certified translation online? There is a lot of confusion surrounding translation, in particular, certified translation services online. So, we thought we’d give everyone the chance to find out a little more about translation services and make it a bit easier to understand also. A translator is tasked with translating a document or piece of text converting it into proper spoken English (or whatever language required). In the U.S. for a document to be considered as certified, there are many obligations to be met. First of all, the document which was translated must have a statement (this must be signed by the qualified translator who completed the translation); stating the text translated is the exact same of the original text with the exception it has been translated into a second language. The statement which must be signed is called a Certificate of Accuracy, though strangely, this doesn’t actually guarantee a document has been translated accurately or correctly. Also, even those who sign a Certificate of Accuracy, it doesn’t mean they are actually certified translators. Now, this can be very confusing, so take your time to get your head around it but basically translators don’t need to be certified translators in order to provide translations which are certified. Many people are mistaken when they believe in the United States of America, translators must be state certified because there is in fact no formal certification process for translators. However, there is a state and federal certification process for interpreters, but they are different from translators. The ATA, American Translators Association however, can offer national certification for translators across the U.S. In fact, there are quite a few different translator associations across the States; however, it is important to remember that none of the associations are offering any official certification just accreditation. Translator associations can offer membership which can provide translators the requirement for certain translation roles. Frequently, translation companies require any translator who wishes to work with them on translations, are to be accredited by at least one translation association. Mostly certified translations are used when statements or documentation has to be entered into a court of law or will be used in an official government office. Things such as birth certificates need to be certified in order to prove the document’s information is correct and matches official records. 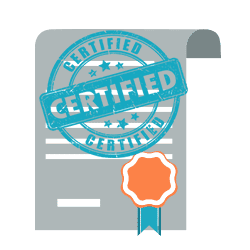 There are different types of certified translation services online however and if you require this service, it’s important to take the time and ensure you understand what certification is needed. For example, if the translation must be notarized, then the translator who is doing the work will need to include their resume with the translated document as well as qualifications he or she has. You use all kinds of abbreviations and slangs when you are texting or emailing your friends. But if you have to send a text or an email to your professor or your boss, your language becomes formal. You follow all the rules of formal conversations. The text you send starts with a salutation and end with a greeting, just like a proper letter. So when you are submitting a document to a government department or an office, it has to be in the right format. You can’t print out a document you made in Photoshop and submit it to the immigration office or the court. The same rule applies to translations. When you have to submit a translation to a government office, it has to be perfect. If you think translating certificates online is a good idea, then you can’t be more wrong. You can’t translate important documents like birth and marriage certificates online. Only certified translations of such documents are accepted by government departments. If you’re not provided with a certification of translation by the translation agency, then you will be in trouble. So choose UTS for all kinds of certified and notarized translations.